The political debate over building a wall on the United States’ southern border is a frequent prop for misinformation online. We’ve written about a lot of bogus claims related to it. A review of Dobbs’ recent episodes shows that he hasn’t covered any such claim and a spokeswoman for Fox Business Network, Emily Burnham, confirmed to FactCheck.org that the claim hasn’t been reported on his show. While he didn’t report the claim on his show, Dobbs did tweet a link to a story that made a similar claim without offering any evidence to support it. That story, posted on The Gateway Pundit, carried a headline that said: “Reason Why Democrats Don’t Want Border Wall? The DNC and Clinton Foundation Both Reportedly Paid Off by Mexican Cartels.” But the story didn’t support that headline. It cited only three things: a 2016 story about a Texas defense attorney who had represented clients accused of drug crimes and had donated a total of $2,000 to Hillary Clinton’s campaign committees (a $1,000 donation in 2007, when she was running for president, and a $1,000 donation in 2005, when she was running for reelection to the Senate); claims made on Twitter by a man who is suing the Democratic National Committee; and a two-year-old hoax story from a now-defunct website. The hoax story, which was posted on a site made to look like the New York Times (but is unrelated to it, according to domain registry information), had claimed that a report released by WikiLeaks found that the infamous drug lord known as El Chapo had given $15 million to Clinton’s 2016 presidential campaign. There is no such report on WikiLeaks, and, of course, campaign finance laws bar contributions from foreign nationals. All contributions made to Clinton’s campaign can be seen on the Federal Election Commission’s website. The Gateway Pundit cited Pelosi’s visit to Mexico in 2016 and showed her with then-President Enrique Peña Nieto in a strained and baseless attempt to link her to illegal drug money. Pelosi and Republican Rep. Richard L. Hanna led an official bipartisan congressional delegation to Mexico from May 1 to May 3, 2016, government records show. Updated, Feb. 14: We added new information we found about a tweet from Lou Dobbs that linked to a related story. Wagner, Dennis, et al. “The Wall — A 2,000-mile search for answers.” USA Today. Accessed 12 Feb 2019. Burnham, Emily. Spokeswoman, Fox Business Network. E-mail sent to FactCheck.org. 11 Feb 2019. Dobbs, Lou (@LouDobbs). “Reason Why Democrats Don’t Want Border Wall? The DNC and Clinton Foundation Both Reportedly Paid Off by Mexican Cartels https://www.thegatewaypundit.com/2019/01/reason-why-democrats-dont-want-border-wall-the-dnc-and-clinton-foundation-both-reportedly-paid-off-by-mexican-cartels/ … via @gatewaypundit.” Twitter. 30 Jan 2019. Hoft, Joe. “Reason Why Democrats Don’t Want Border Wall? The DNC and Clinton Foundation Both Reportedly Paid Off by Mexican Cartels.” Gateway Pundit. 30 Jan 2019. Hoft, Joe. “Mexican Cartels Paid Off Mexican President with $100 Million – Former Democrat Claims Democrat Party Being Paid Millions by Cartels As Well!” Gateway Pundit. 27 Jan 2019. “WikiLeaks: Mexican Drug Kingpin, El Chapo, Donated 15M to Clinton Foundation.” Times.com.mx. 9 Jan 2017. Code of Federal Regulations: Title 11. Federal Elections. Section 110.20. Accessed 12 Feb 2019. Reyes, Dayna. “Bipartisan congressional delegation visits Mexico City.” Rio Grande Guardian. 5 May 2016. U.S. Congressional Record. 20 Jun 2016: 3972-3974. 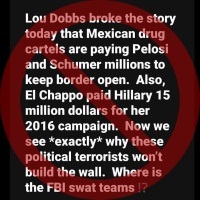 "Lou Dobbs broke the story today that Mexican drug cartels are paying Pelosi and Schumer millions to keep border open."